We are currently back in Wisconsin, and have been very busy with a new work camping opportunity. As such, we will not be working at Amazon this fall. We will miss seeing all of our friends that we have worked with for the past three years, but we will be back there next fall. And even though the broken bone in my foot has healed, I was hesitant to walk 13 plus miles each day on concrete. For those interested in learning more about Amazon, just put ‘Amazon’ in the search box on our website, and you will see dozens of our prior blogs. We are staying at State Fair RV Park, in West Allis, which is surprisingly busy for this time of the year. The manager said in 20 years, they have never had this many RV’s here this late in the year (it is open year round). It is nothing more than a very expensive parking lot with full hook-ups. At first we were told our water would be shut off on November 1, but with the large number of people, and the unseasonably warm weather, we should have water until at least November 25th. They do have one section with heated water pipes, but that is full until December. We dropped Makena off at Dan’s parents, so she is not home alone all day and she gets to chase her football around in a big yard. This gives us more flexibility in our work schedule. Makena hinted that she is working on a blog, so stay tuned for her post! This summer our friends Mike and Karlyn contacted us to see if we could help them out with some remodeling work. They currently run a successful bar and grill in New Berlin, The Varsity Club, and found a space to lease in Menomonee Falls to open a second tavern and eatery. Dan helped out with the remodeling for their first place, and they wanted us to help out again. We arrived back in WI on October 4th, and started work right away in the 5th. With the exception of going up to visit Makena and Dan’s parents, and seeing two Packer games, we have been working every day. The building is old, but has great potential, so there is a lot of work to do. The local building inspector is excited with the changes. We are still in the deconstruction phase. Give me a sledgehammer and I’m a happy camper! Mike has two young guys that have been helping out, and they had done a lot of work before we arrived. So I do not have any ‘before’ photos. This is what the place currently looks like. Dan and I have started building the bar, which is shown in some of the photos. That bar stool was left over from the prior occupant. There will be a full kitchen, and it will be walled back in. The guys had to open up the wall to get all the old equipment out. When they were taking off the drywall, an old air conditioner was discovered (the wiring was still “live”). There are also old windows, that have been covered up and bricked over on the outside of the building. The guys spent a lot of time working on busting out the old air conditioner, which was quite heavy. And yes, the old ceiling was painted blue, yellow, red and green in various parts! There is also a basement that we are fixing up as well, for party rentals. the guys spent 3 days breaking up the concrete and hauling it out. This will allow the plumbers to bring all the plumbing up to code, and we will be adding a bathroom in the basement. It was a lot of hard work, but the prior tenants had pipes running all over the place. This is a better shot of the basement, and the area we are building for a bathroom. We will drywall the ceiling, and use knotty pine on the walls. The tile floor is in good shape, one of the few things in this old building. As of right now, we are planning on staying here until December 6th. They are planning on opening up the bar, called The Alumni Club Tavern and Eatery in late January. Mike and Karlyn want us to stay longer, and our fifth wheel is designed for ‘four season’ living, but we are hesitant stay in the snow. So far, temperatures have been above normal. So we will see how things go. Our Florida reservations start 12/28. For the time being, it is just eat, sleep, work! Similar to Amazon! Hopefully we will be able to have some time to see some of our friends, relatives and former co-workers before we leave the state. We have been Green Bay Packer season ticket holders for many years, and try to get to at least one game each season. This year, we made it to two, both in the same week. The Dallas Cowboys game was not a good game for the Packers. Prior to the game, we attended the Jack Link’s Protein Snacks party. Good food, great people, and perfect weather all combined to make for a good time, despite the poor performance of the Packers. Ellen, Mary Jo (Mrs. Jack Link) and I. We have sat together for over 20 years! It is always good to get together with everyone! We even ran into Sasquatch at the party! The game against the Chicago Bears on Thursday night was much better, although the weather was about 40 degrees colder! We had some ‘spiritual’ fans stop by our tailgate party! 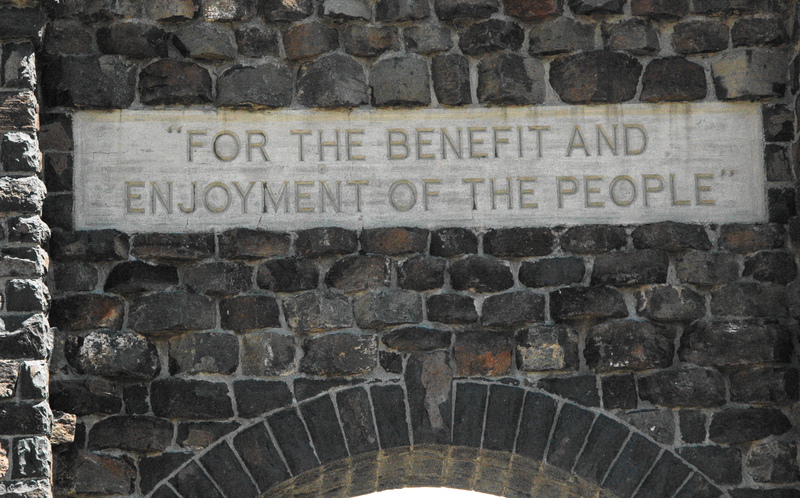 Today is the 99th Birthday of the National Park Service! We have taken advantage of having an entire summer to explore at the very first National Park, Yellowstone. We are very grateful that many intelligent folks had the foresight to protect and preserve so many parks, monuments, caves, historical sites, etc., for future generations to enjoy. 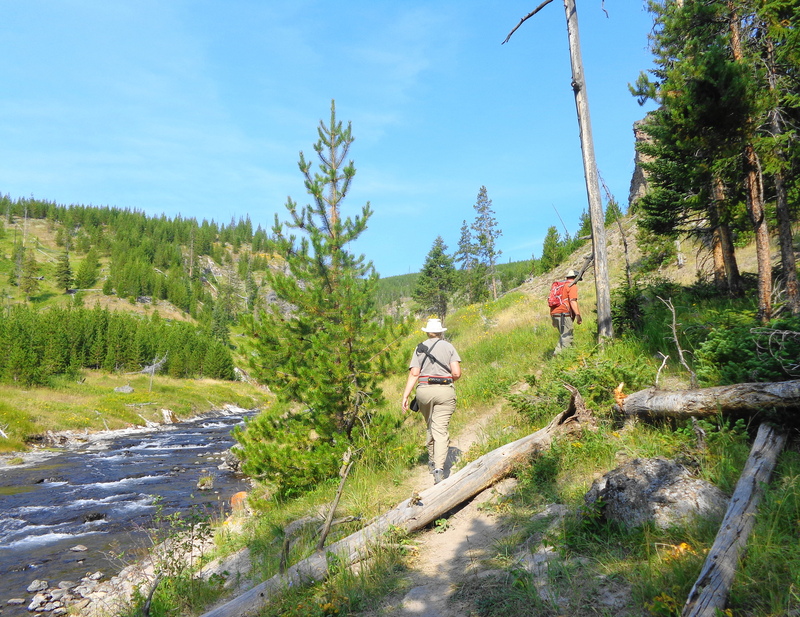 Yellowstone is such a wonderful park with so many unique features and areas to explore. Previously I have written about the thermal features in great detail. Instead of doing a lot of separate posts on the different areas, this one will summarize our last several visits. So this is a bit photo heavy. The animals are a big attraction in the park, and sometimes people forget this is not a zoo. The animals are wild, and this is their home. 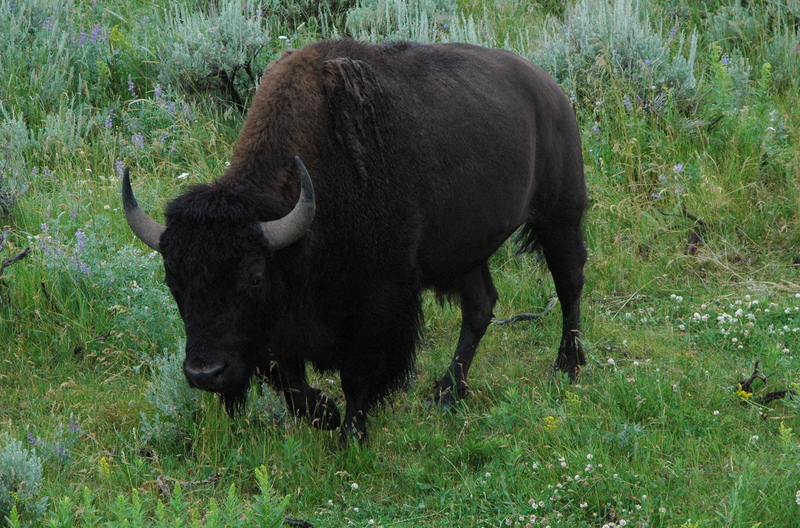 To date, five people have been gored by bison (buffalo). 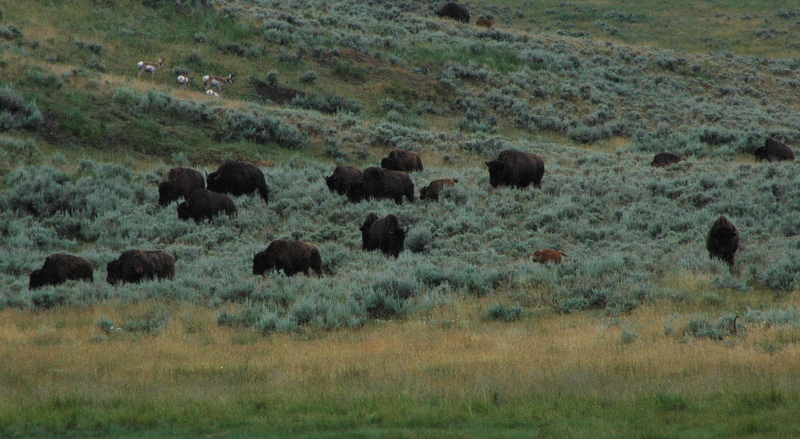 Four of them simply walked up to the bison to take a better picture, and one startled a sleeping bison while hiking. Just remember, bison have no interest in being in your “selfie”! 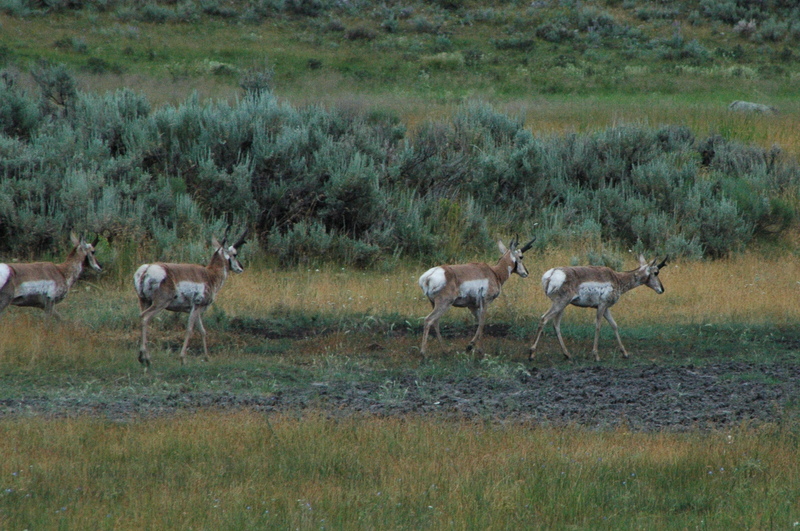 We have seen our fair share of animals, except for a grizzly and Bull Moose in the park. 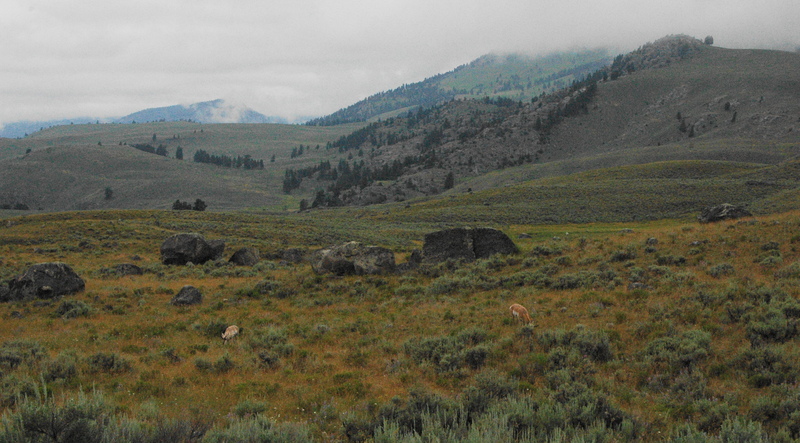 The Lamar Valley area is best known for animal sightings, and we spent a day driving in that area. If you want to see animals, go early (think 6am). 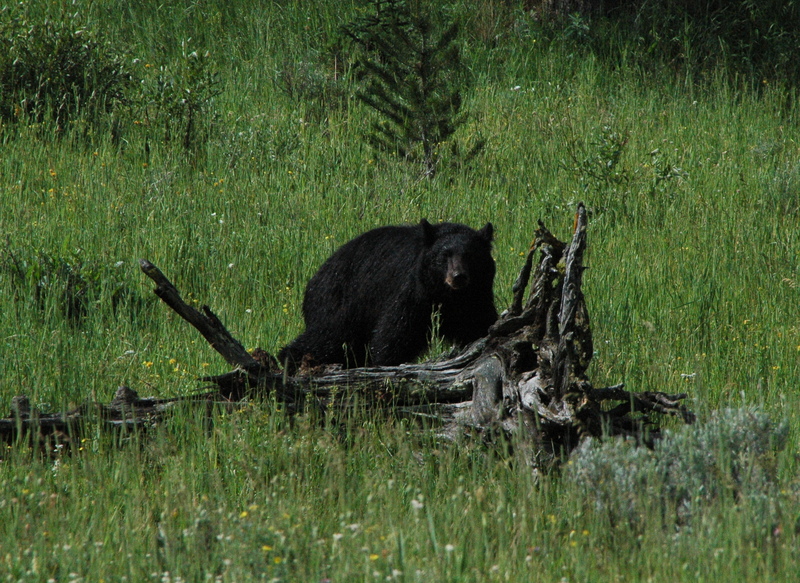 But the highlight of our trip this day was seeing a bear foraging for food. We watched him/her(?) about 10 minutes lifting up trees stumps with ease, searching for food. The bear finally stopped and looked back at all the people, and then disappeared into the woods. A park ranger had also stopped, to insure people were not getting any closer to the bear. We stayed in our truck, but many people had exited their vehicles. I think my photo from the safety of the truck turned out just fine. No need to walk closer to the bear. 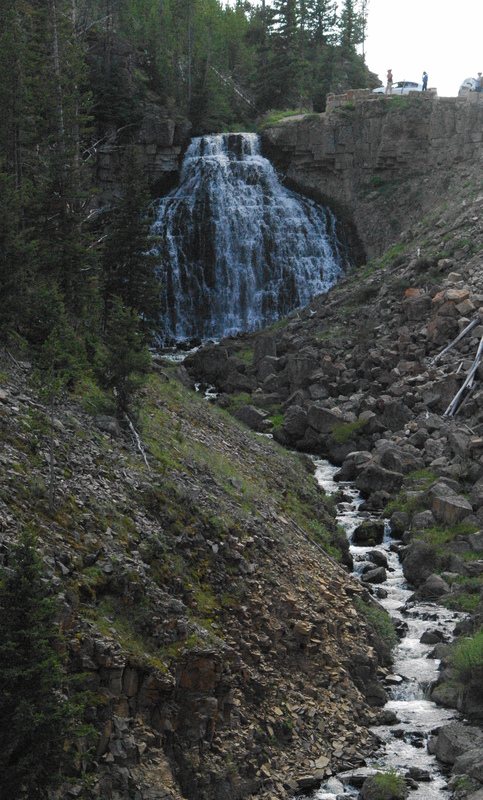 As you are aware from previous posts, Yellowstone has plenty of waterfalls. After viewing the animals, we headed over to Tower Fall, which we had not yet seen. 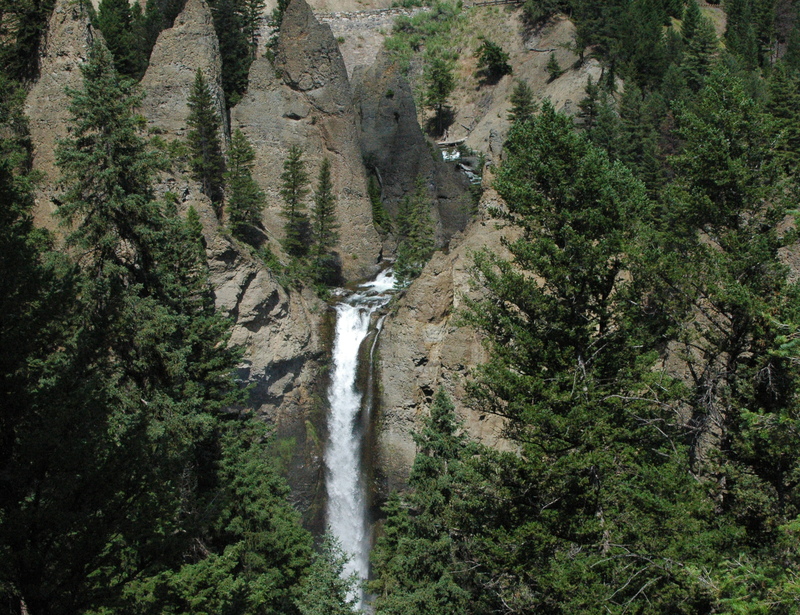 At 132 feet, the falls is a very popular viewing area. It is a very short walk (150 yards) from the general store in the Tower-Roosevelt area of the park. I am not sure why it is called Tower Fall, instead of Tower Falls. There is a more challenging ¼ mile walk down to the river, but you are rewarded with some nice views in the valley. 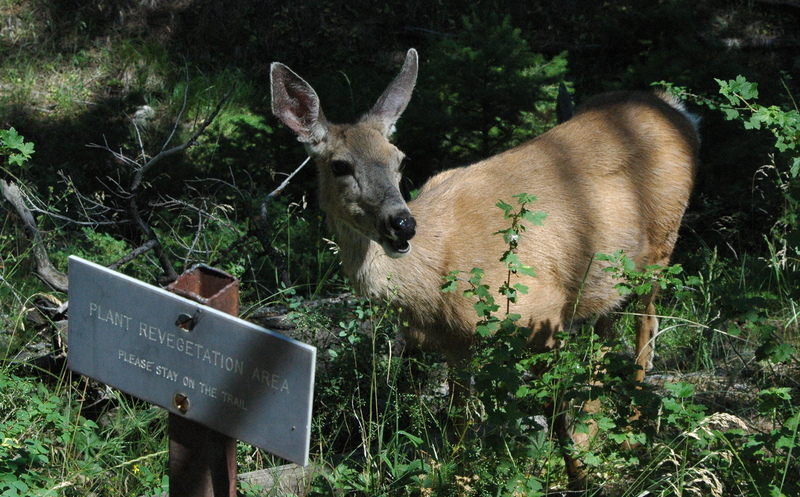 On our way back up, we encountered a baby pronghorn that was munching away right on the path, oblivious to the warning on the sign! After viewing the falls, we decided to hit the Norris Geyser Basin even though it was over flowing with visitors. They say attendance is way up this year, and we believe that! 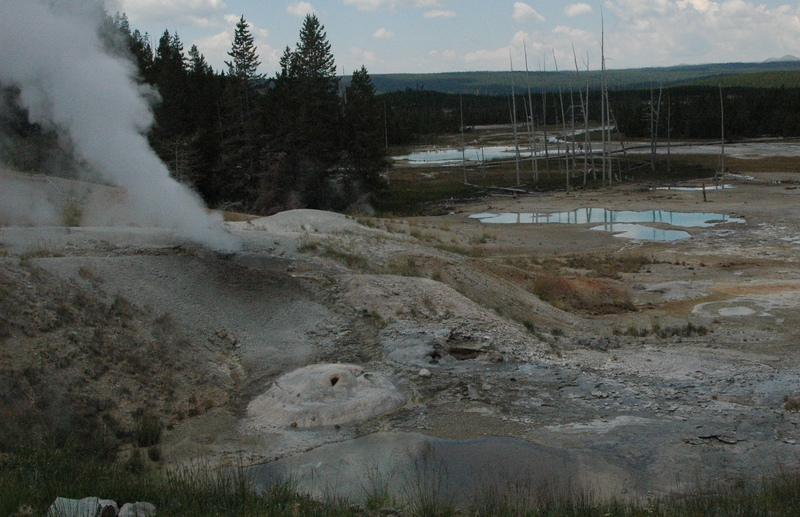 This geyser basin has a lot a fumaroles (steam vents), which are the hottest of the geothermal features in the park. They have been measured at 280 degrees, and quickly boil away what little water is in the vent. On another day we checked out the artist paint pots area, which is a short walk around some mud pots, geysers and hot springs. The trail climbs to an overlook, which gives a nice overview of the area. 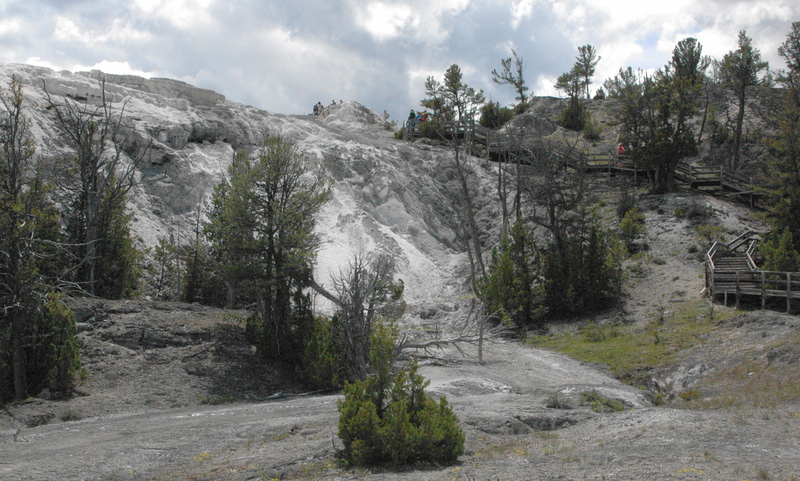 Another section of the park, on the way to Old Faithful, has more paint pots. 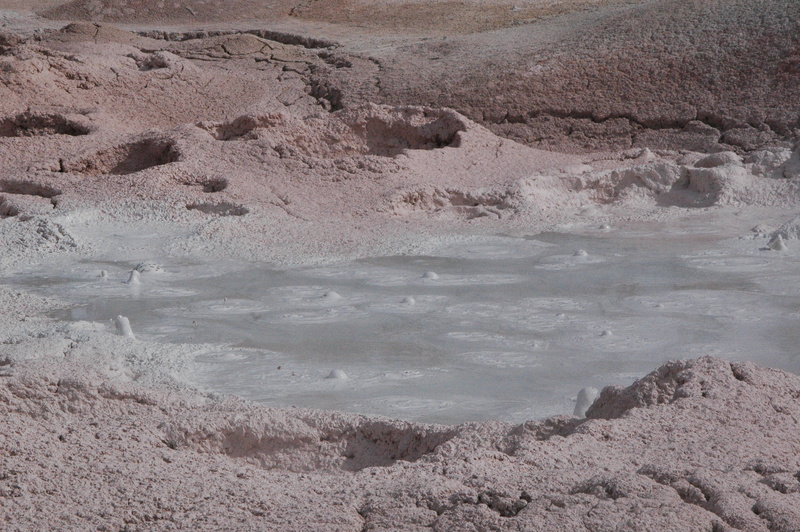 Paint pots are a vat of bubbling mud formed by the mixture of heat, gases, volcanic rock, water, minerals, acid and living microorganisms. The pots in the Fountain Paint Pot section are fun to watch. Photos just do not do justice to these. You have to watch and listen to them plop and throw mud up and around. 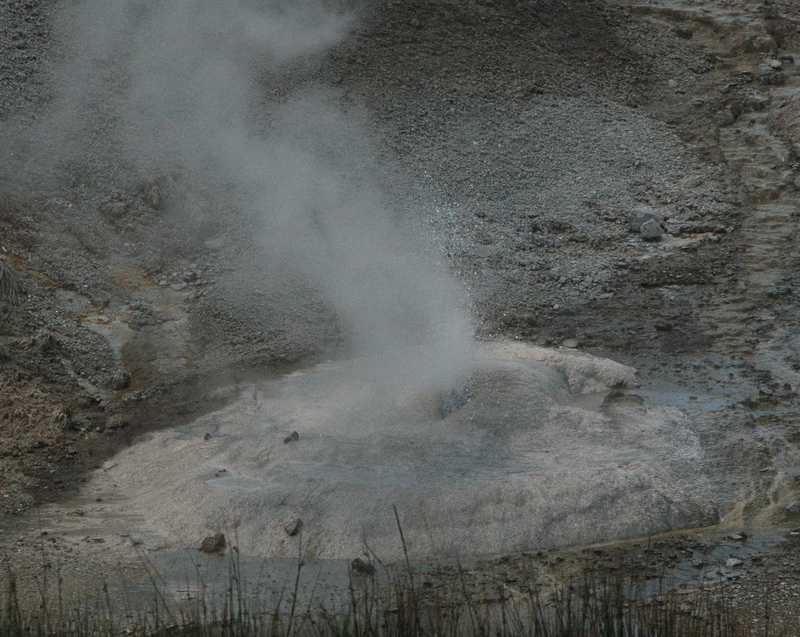 In this same area, is another fumerole, Red Spouter. 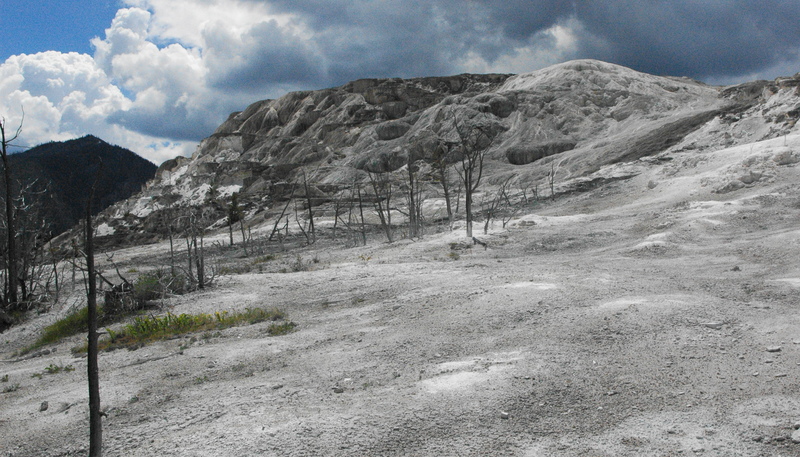 This was formed after the earthquake in 1959, which is example of just how unstable the ground is in many parts of Yellowstone. Prior to the quake, it was just a grassy hill. 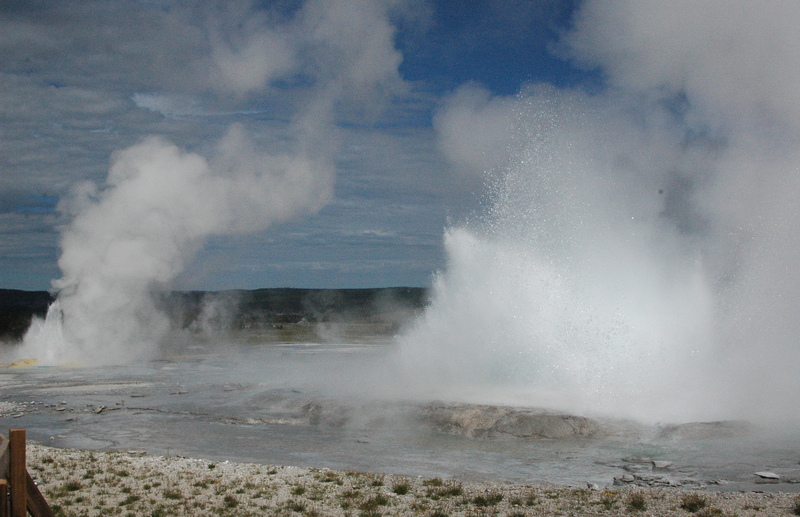 And as luck would have it, we were fortunate to watch two geysers in this area erupt at the same time! 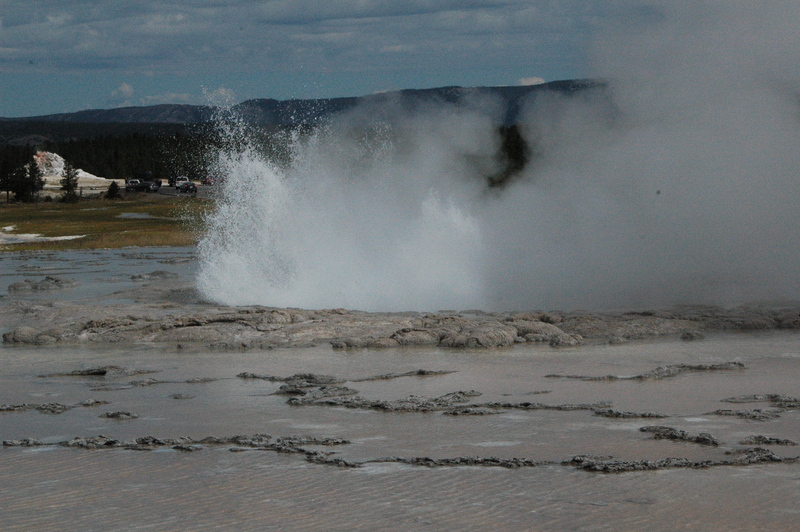 Spasm geyser on the left, and fountain geyser on the right. 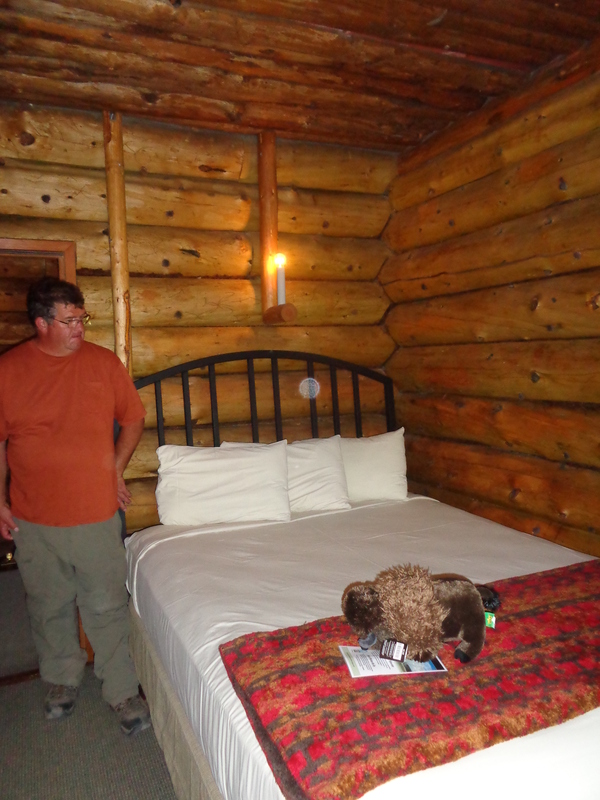 Having our geyser fix, we headed down Firehole Lake Drive to see what was located there. 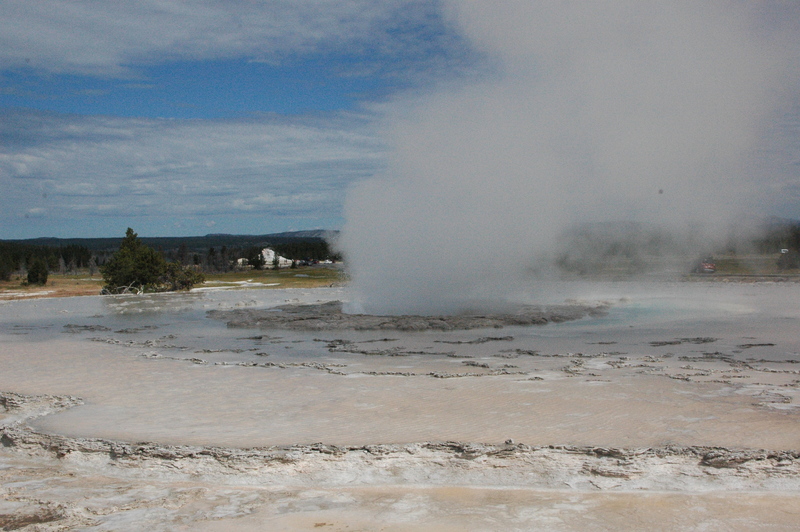 The Great Fountain Geyser, which had erupted the day before, was still very impressive to look at. If you notice in the picture above, there is a castle shaped geyser in the background. (you may have to click the picture to enlarge) Shortly after this photo, that geyser started to erupt, so we watched from a distance. 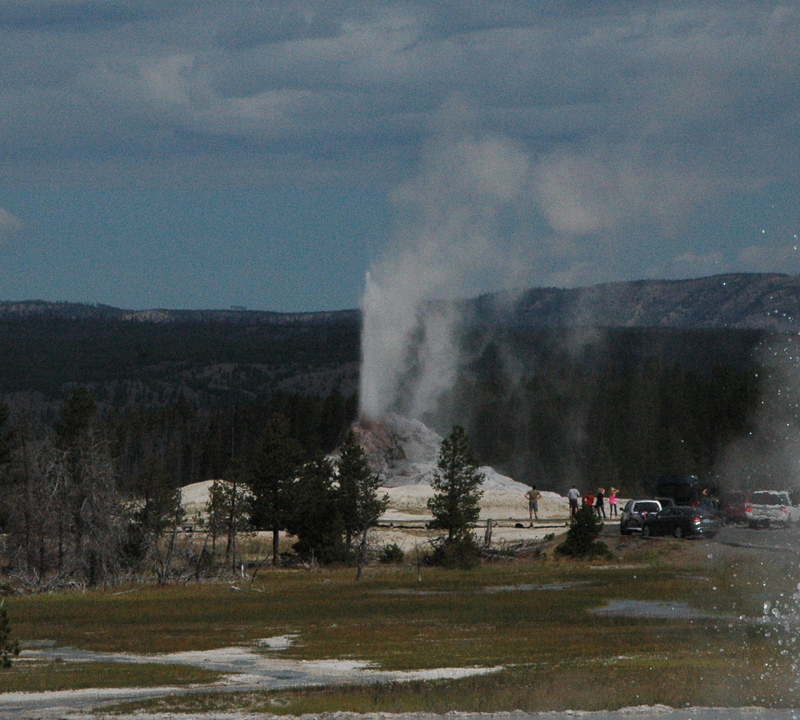 Given the relatively few people around that geyser, it was not a planned eruption. After that one settled down, the Great Fountain Geyser started acting up, spewing a bit of water, before settling back down. 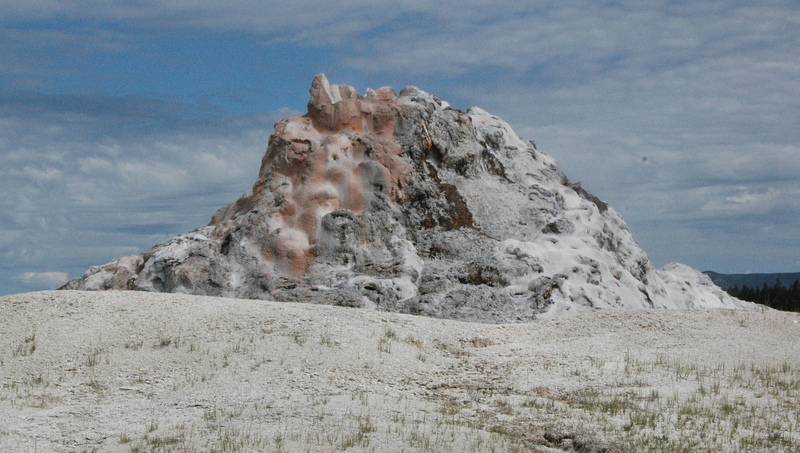 We drove over to the White Dome Geyser for a closer look. 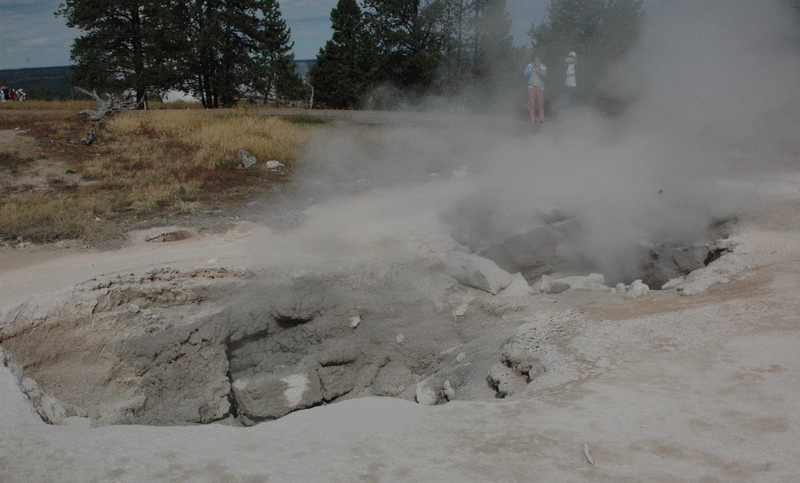 This geyser continues to get taller every year, as a small amount of silica is deposited on the sides after each eruption. On our last visit to the park, we explored the West Thumb Geyser Basin and Yellowstone Lake. Due to the wildfires in Montana and Idaho, the air quality has really decreased, and there is a constant haze over the area. We stopped along the road to watch this little geyser erupt, with Yellowstone Lake in the background. You cannot see the mountains on the other side due to the haze. Fishing Bridge used to be a popular area for fishing, but the park service no longer allows fishing in the area, as people were too successful, and the wildlife in the park depends on the fish more than us humans do. I was lucky to snap this photo just as four corvettes were crossing the bridge. 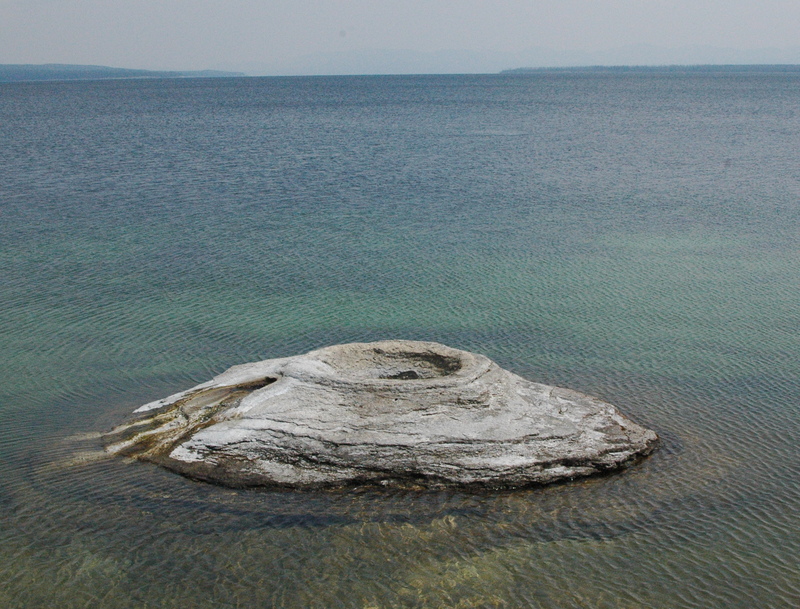 The most famous feature at the West Thumb is this hot springs fishing cone in the lake. Fisherman would boast about how they could catch a trout in the lake, then dunk it in the boiling water in the cone to cook it! This practice was banned in 1911. 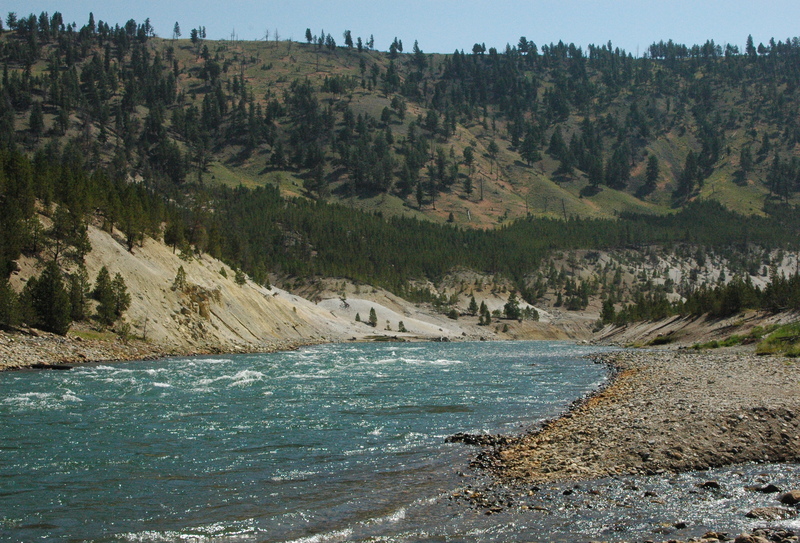 We just never get tired of all the ever-changing features of Yellowstone National Park. It is truly an amazing place. If you have never visited, please put this on your ‘bucket list’. You will not regret a visit to the park, even if you only have a day. 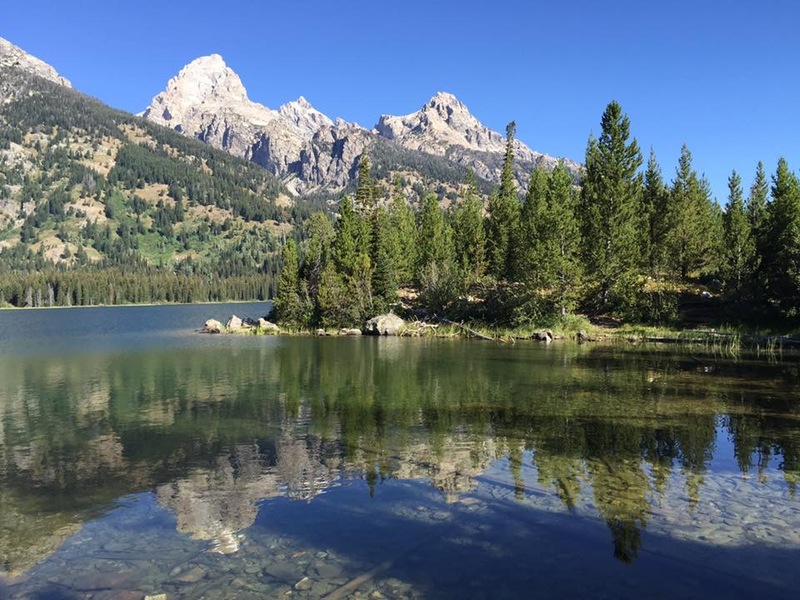 Thank you for following along this summer on our trips to Yellowstone. Hopefully you have enjoyed the photos (we have taken hundreds each visit), and learned a few things on geothermal features. Wow, it is hard to believe that our time here in West Yellowstone is almost over! We have only 4 weeks left of work, before we start venturing back east for a few weeks to visit with family and friends, as well as dentists and doctors (for Dan….Makena and I are good!). Then we will be heading down to begin our fall jobs at Amazon in Jeffersonville, IN. The temperatures here still get in the low 40’s at night, with 70’s during the day. It has been a very pleasant summer. We have been venturing into Yellowstone every week, mostly for just a few hours, as it gets extremely crowded. Towards the end of August, it should get better, as the kids start going back to school. Since we need to start increasing our walking to get ready for Amazon, we met up with friends for two hikes last week. Originally, I was going to do both hikes in one blog, but decided to split them up, as it was getting a bit lengthy. So the second part will be posted in a few days. 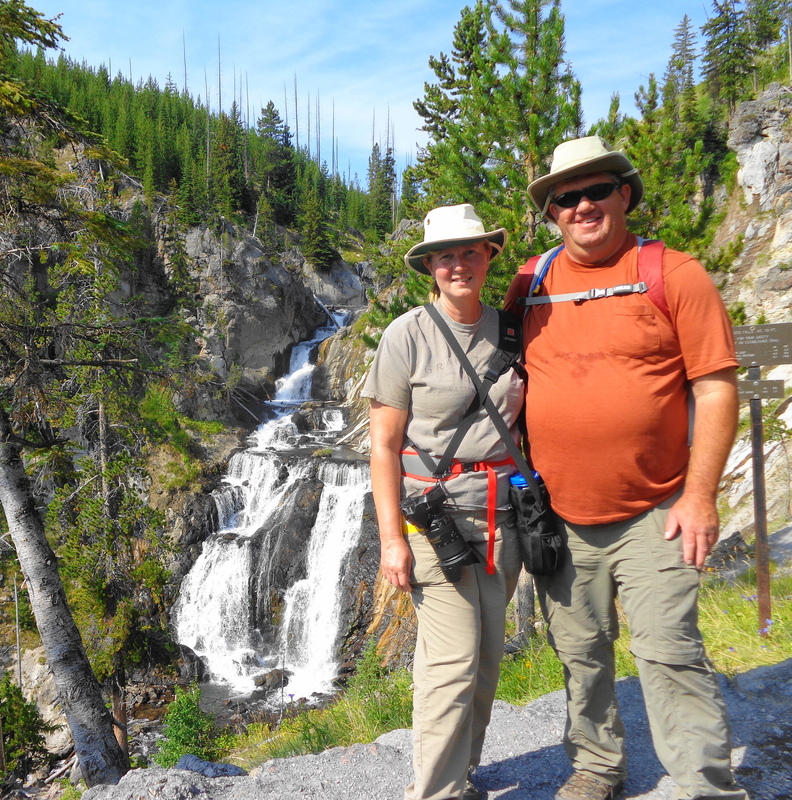 On Sunday, we met up with Karen and Al at Biscuit Basin in Yellowstone for a short 3 mile hike to Mystic Falls. We started out looking at the various geysers in the area, the most famous of which is the Sapphire Pool. It had biscuit shaped formations surrounding it, but they were all blown off in the 1959 earthquake (our previous blog gave more details about this earthquake). The beautiful sapphire color remains, and it is one of the prettiest geyser (as far as color) that we have seen this summer. The trail starts out relatively easy, and then the trail splits off. We had been advised to “go left” as it was the easier route to the falls. We discovered later that was very good advice, as it is much easier to go down the steeper climb of 700 feet, then up! 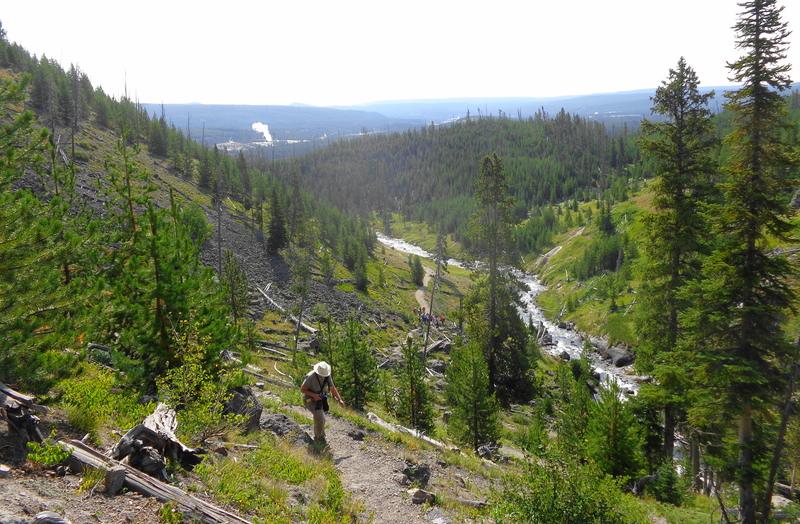 The trail winds along the Little Firehole River, and is very scenic. 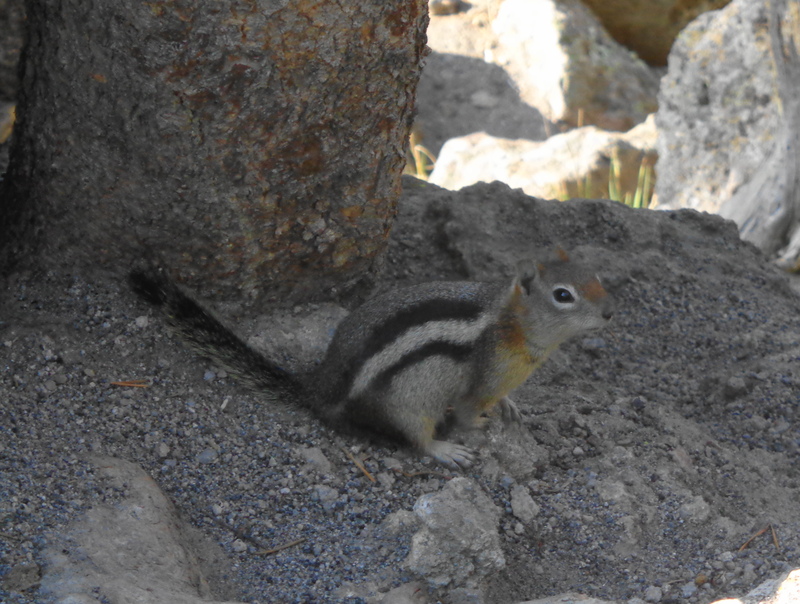 Even though there were “bear aware” signs, we did not see any wildlife at all, except this little guy. After less than a mile, we reached the 70 foot high Mystic Falls. We had 2 options, go back the way we came, or take the more strenuous and less scenic route. We all opted for the latter! The new route back down began with a steep climb, but did offer a nice overlook to the Upper Geyser Basin which is about 3 miles away. 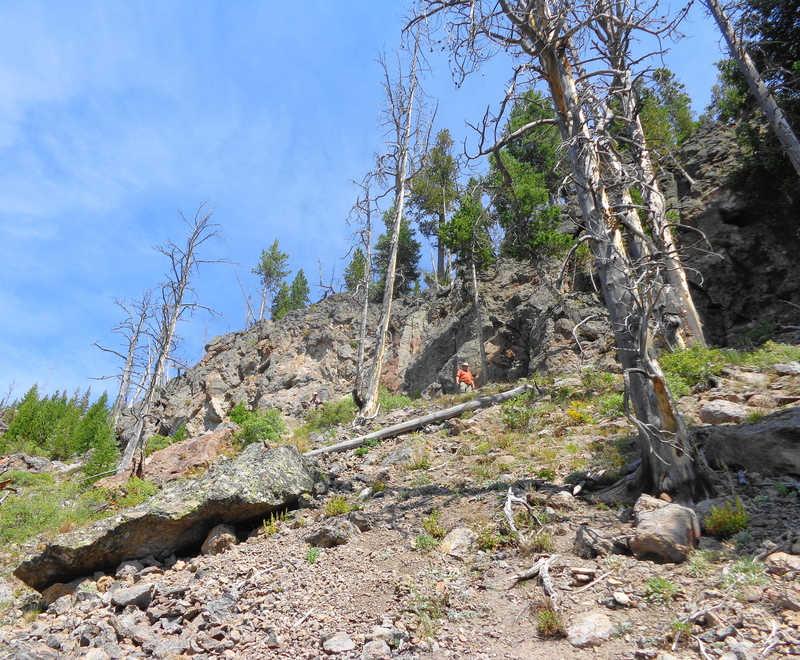 We continued climbing, and commenting that we are supposed to be ‘heading down’. Al has a GPS tracker on his iPhone, and it indicated we had climbed over 650 feet in a very short distance. We were happy much of it was in the shade of the trees. We stopped at the ‘scenic overlook’ which looked over the parking lot and the Biscuit Basin where we began our hike. 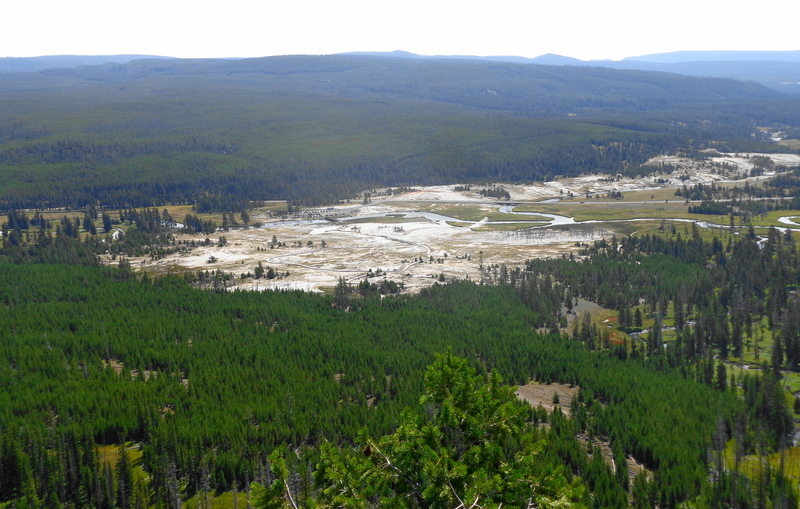 In the upper right corner of the photo is the Upper Geyser Basin where Old Faithful is located. 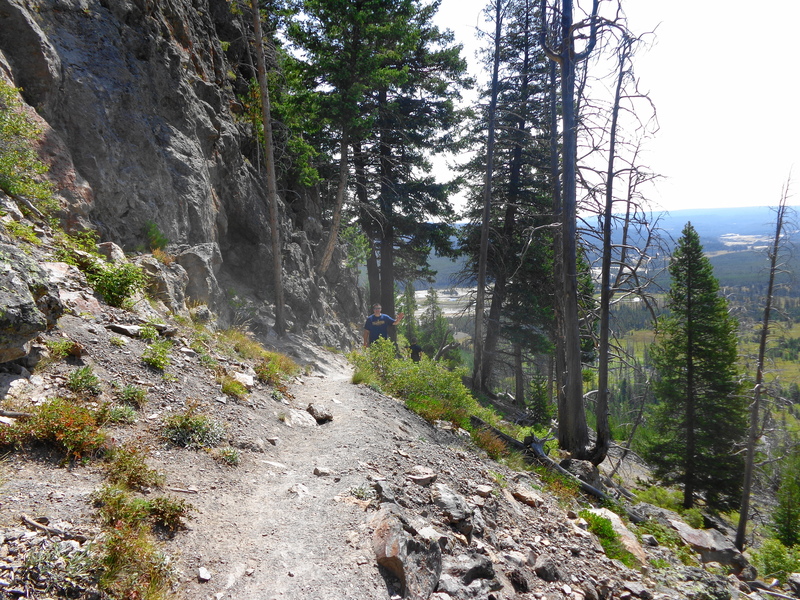 And then we began a rapid descent, going down switchbacks for most of the way. Al’s GPS indicated we were going down a 12% grade. We met a lot of people huffing and puffing their way up, and were glad we chose the “left” option up, and the “right” option down. Dan is in the center of the photo below. Al is the tiny orange dot in the center of this picture. After we made it back down, we decided to go to the Old Faithful Inn for lunch. After lunch, we discovered a tour of the Inn was in progress, so we tagged along on. 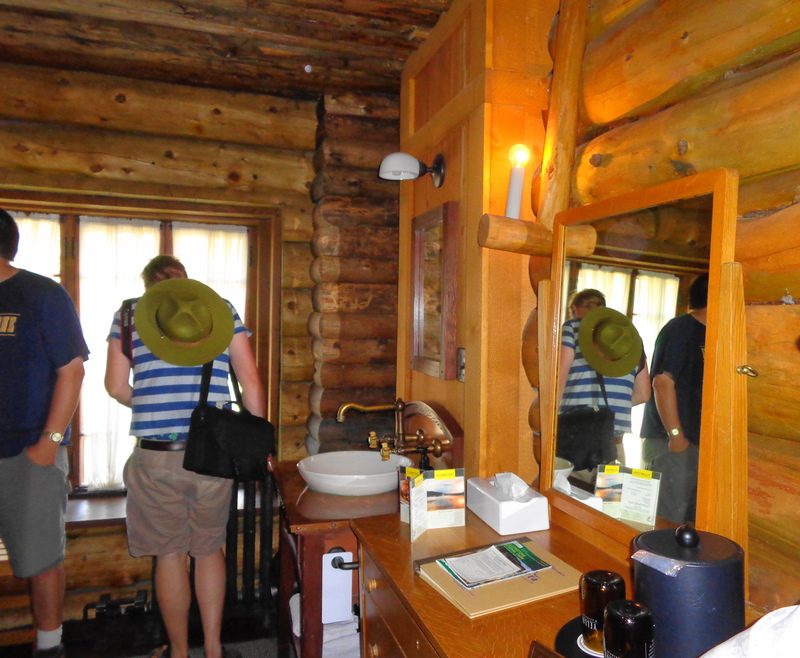 The tour lasts about 45 minutes, and is very informative, and includes a view of one of the rooms for rent. This room rents for $109.00 night, and you have your own sink (not original) but do share a bathroom with everyone else on the floor. It was quite the deluxe room back in the early 20th Century! 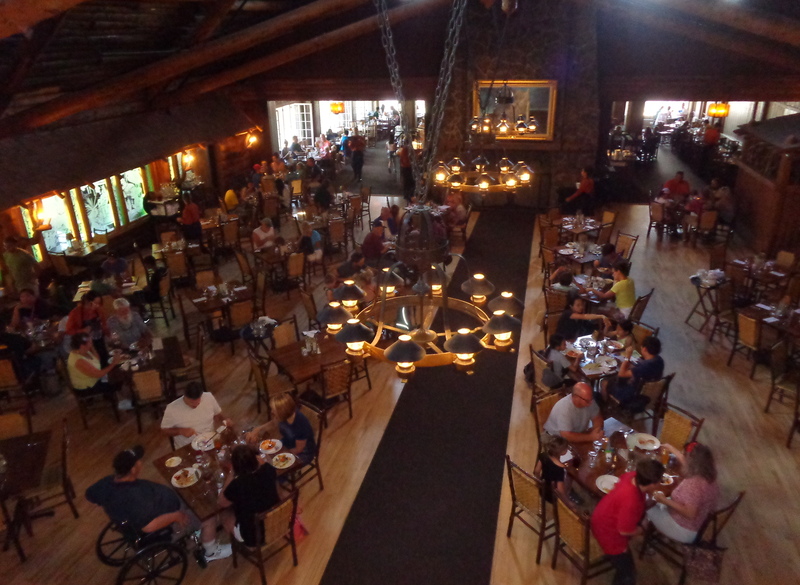 On the second floor of the Inn, there is an overlook into the dining room where we had lunch. 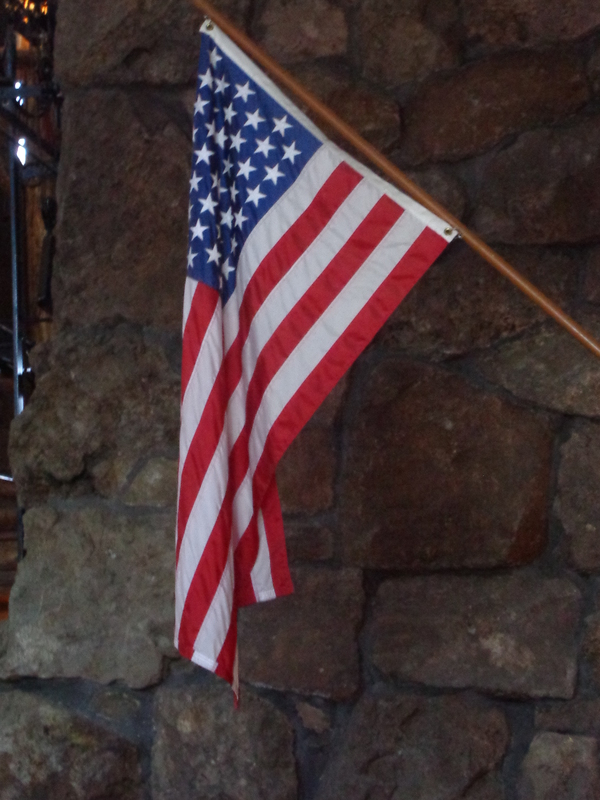 The flag inside the Inn contains 45 stars, representing the 45 states at the time the Inn was complete in 1904. By 1912 there were three more stars added to the flag, with Oklahoma, New Mexico and Arizona being added. The remaining two stars were added when Alaska and Hawaii were added to the union in 1959. We hope to get together with Karen and Al one more time before we leave this area, to do some more hiking. Mammoth Hot Springs is in the Northwest corner of Yellowstone National Park, near the city of Gardiner, Montana. 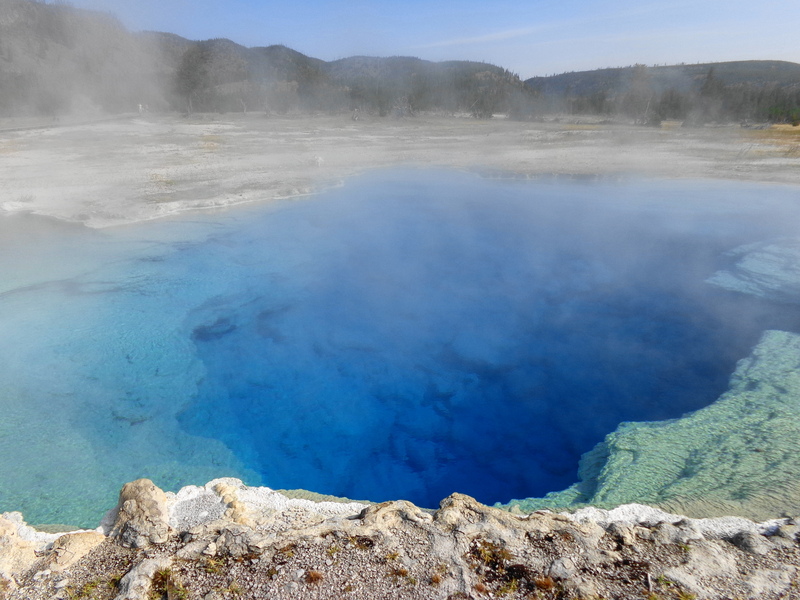 Previously, we discussed how Yellowstone contains the largest hydrothermal features in the world. 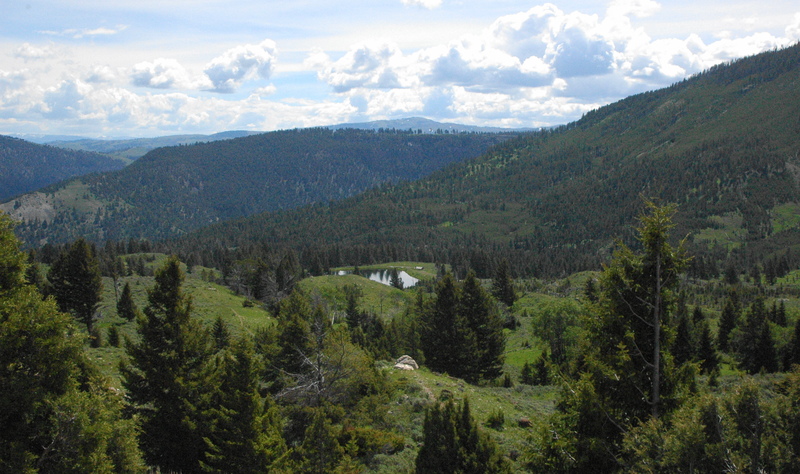 This area, as the name implies, contains hot springs. There are no geysers in the area. 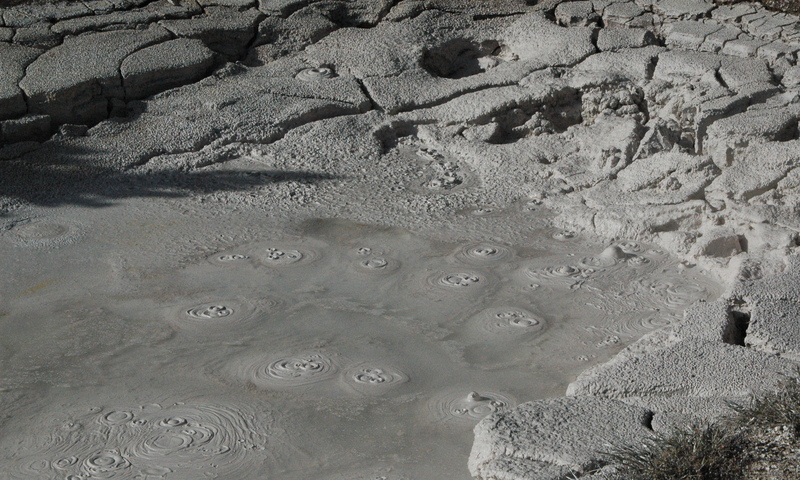 With hot springs, hot water travels underground through limestone, and dissolves carbonate materials. Water can easily flow to the surface where the heat escapes from runoff or evaporation. The water coats the surface with the carbonate materials, which hardens into travertine rock. 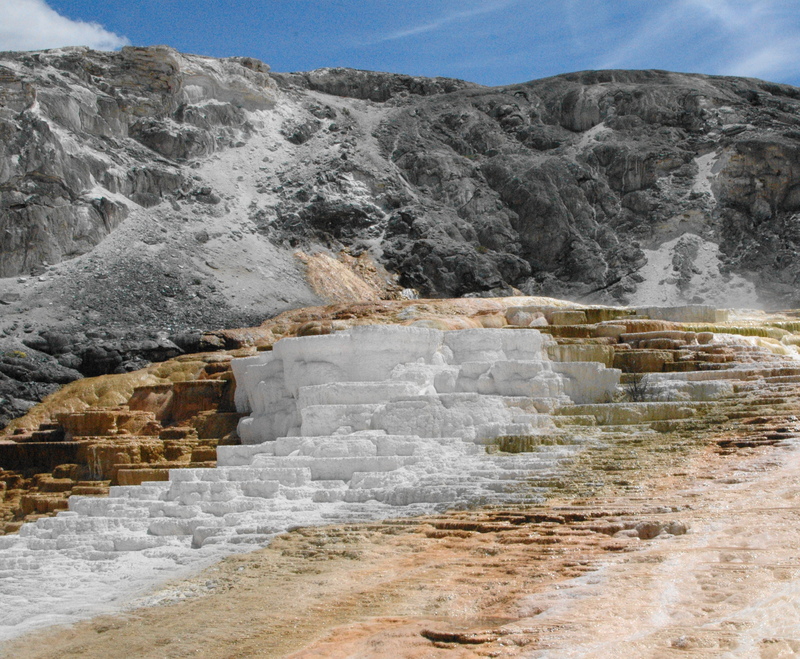 Travertine is too soft to create enough pressure to form a geyser. The drive up to the area is very pretty, and gives you an idea of how expansive this park is. 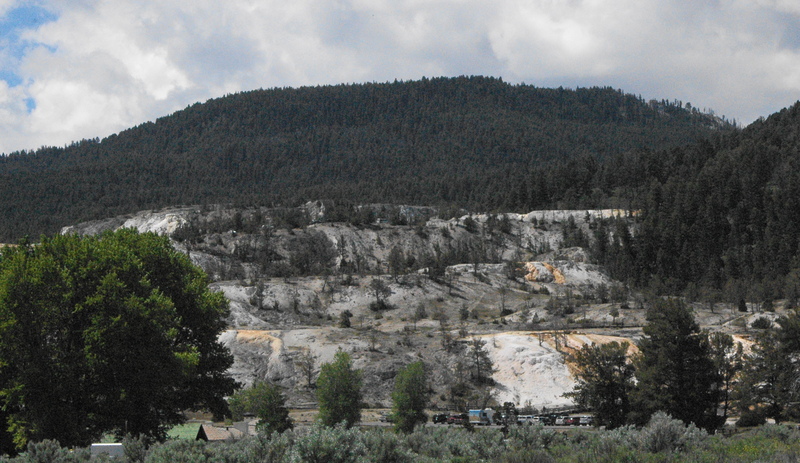 As you get closer to the area, you can see how the landscape changes, as a result of the hydrothermal features. 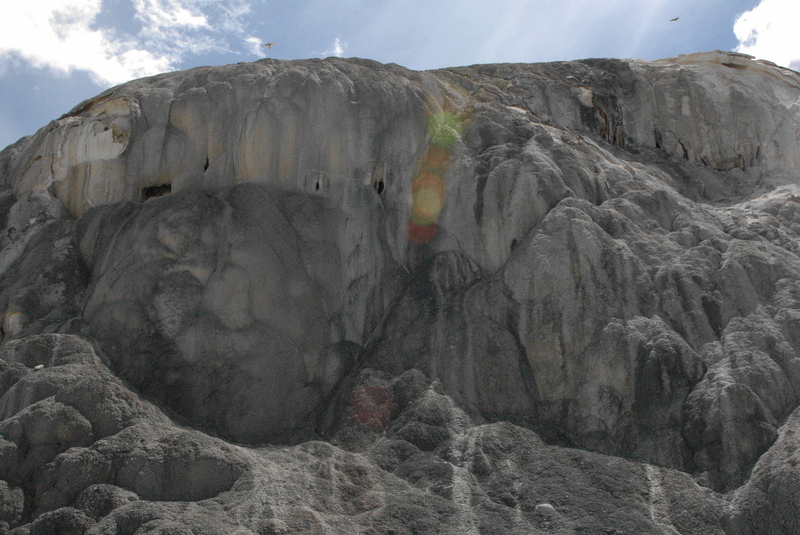 The white colored rock is from the limestone deposits. The park service has put in extensive board walks around the travertine terraces in the area, so you can spend an hour or two taking a leisurely stroll to admire the beauty of these features. The colors in the springs are from thermophiles, an organism (think bacteria) that can survive extremely high temperatures. 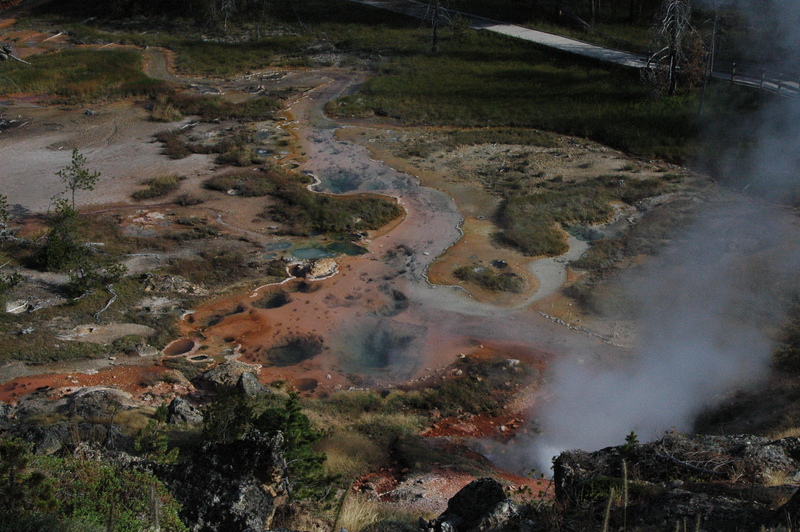 The hot springs area is constantly changing, as it is a living, breathing eco-system. 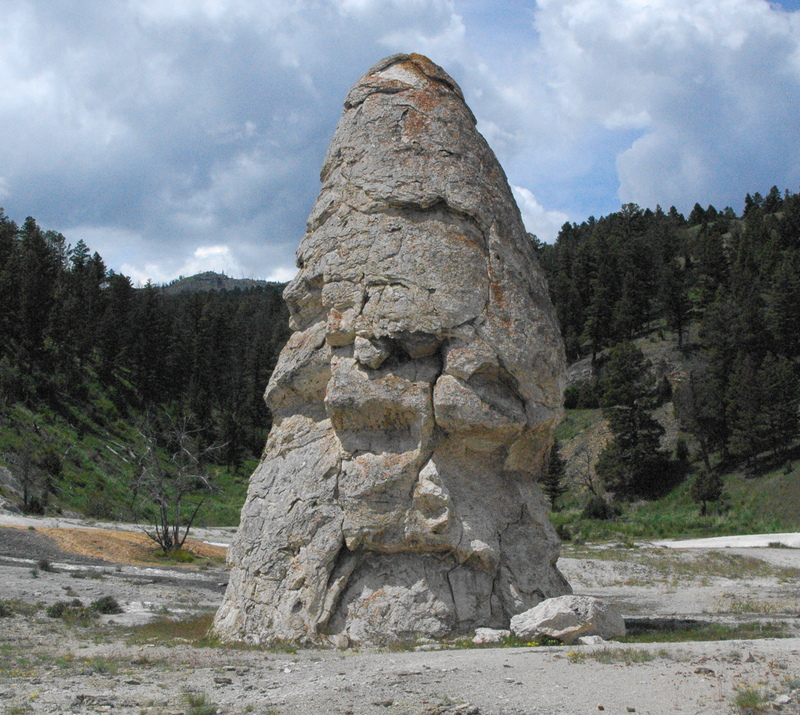 Liberty Cap, a hot spring cone, where the “plumbing” system remained open in one place for a long time, allowing mineral deposits to build up to a height of 37 feet. 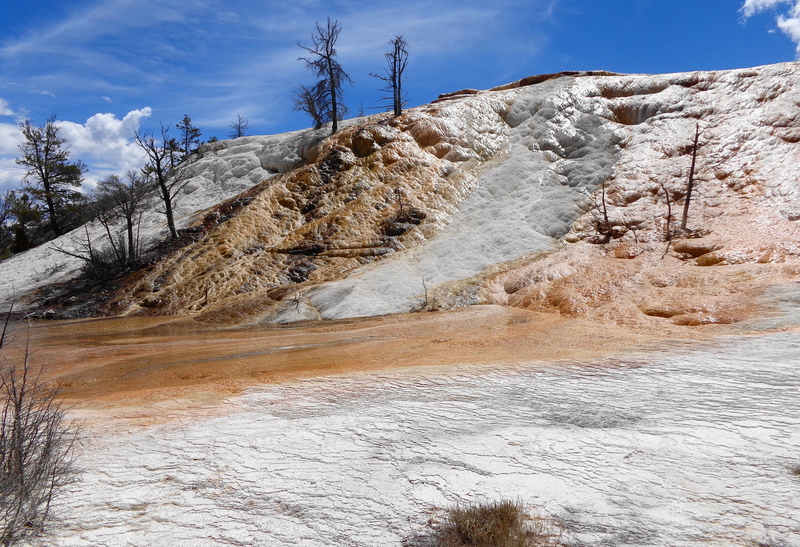 Palette Springs is a beautiful display of the hydrothermal features of this area, created over thousands of years. 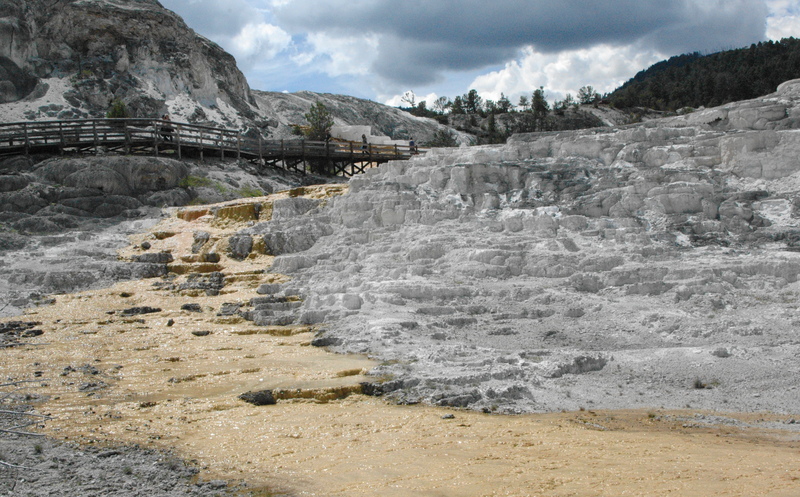 Hot Springs can have a life cycle as this example of Jupiter Terrace demonstrates. 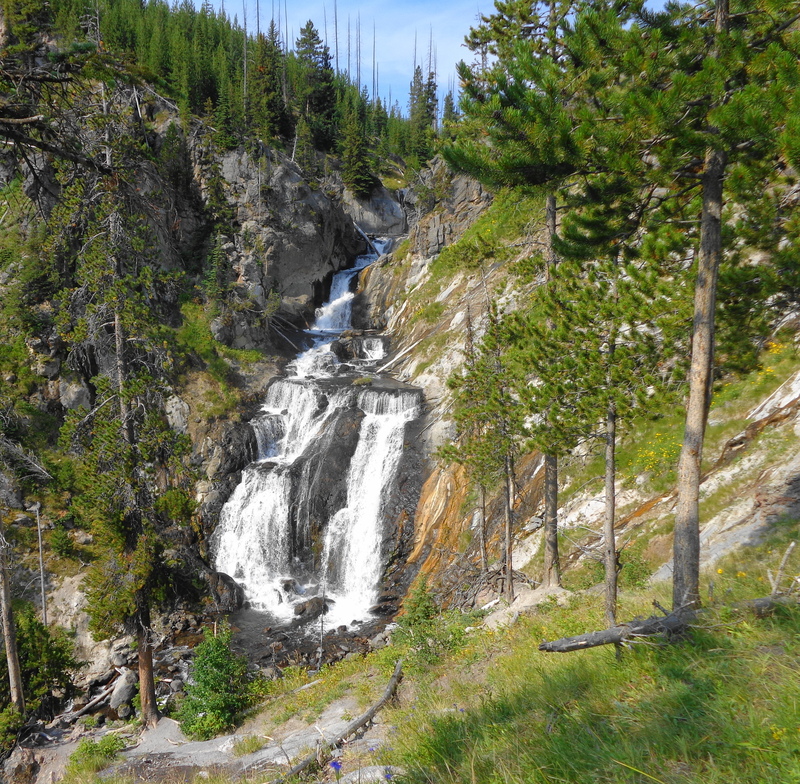 In 1923, it was documented that water was flowing extensively in the area. 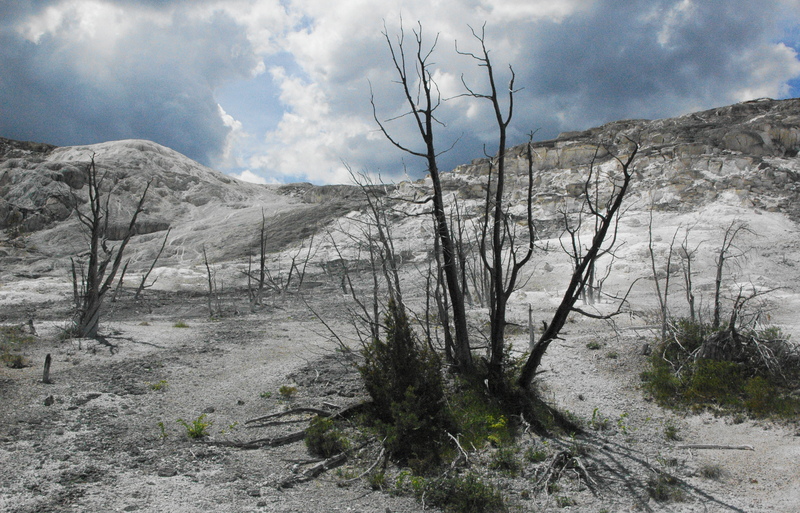 The calcium carbonate materials choked off the roots of the trees, and they died off. Since 1998, this area has been dormant. If it continues to remain dormant, new trees and grass will start to grow in the area. As you can see by this picture, a small amount of vegetation has grown over the past few years. 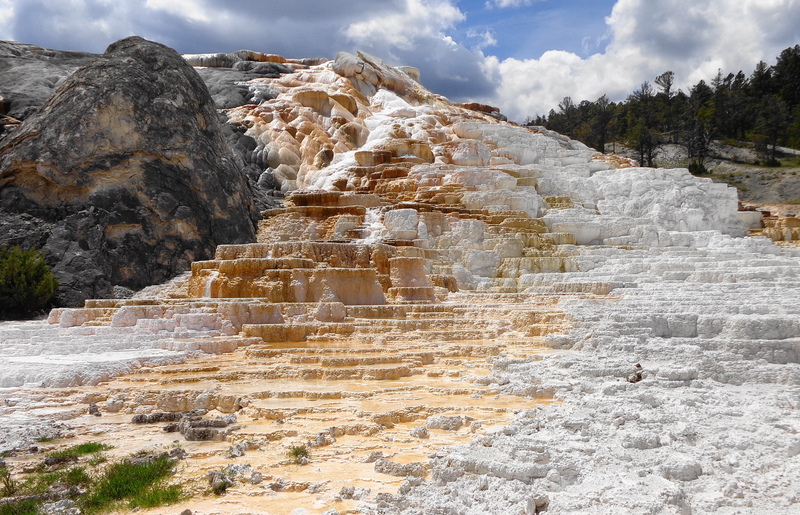 Minerva Terrace is an area that alternates between abundant water flow, and minimal flow. This changes over several years. The area of color, is where the water was flowing when we were visiting. 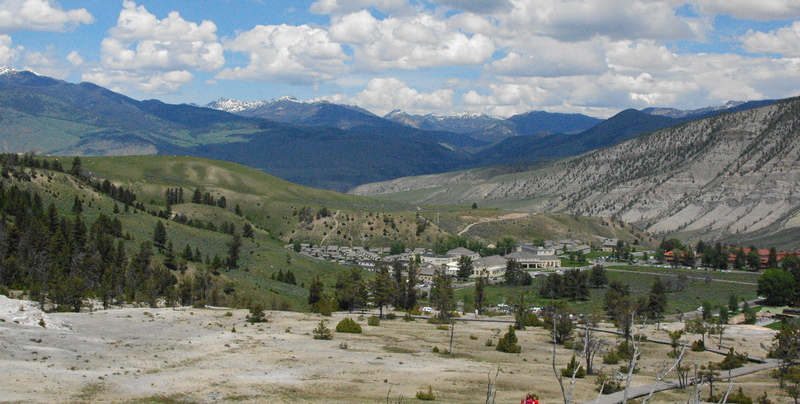 This is an overview of the Mammoth Hot Springs visitors center, shops and hotels. 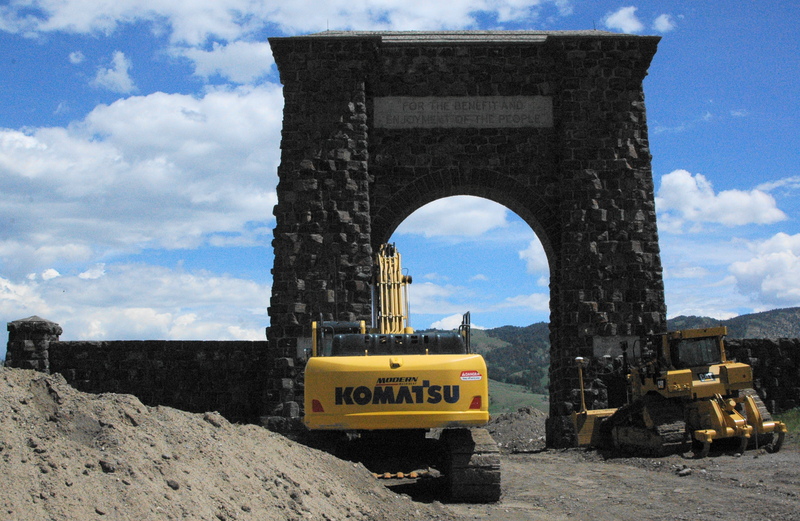 The park service and the town of Gardiner are re-doing the entrance into the park and making the road through the arch one-way, with pedestrian access as well. There is a doorway in the arch, and people will be permitted to walk through the door. The town is also putting a bypass around the arch, to improve traffic flow. This construction should be completed later this year. After a brief stop in the town of Gardiner, we headed back into the park, and down towards home, with a brief stop to check out the Golden Gate Canyon bridge and waterfall. 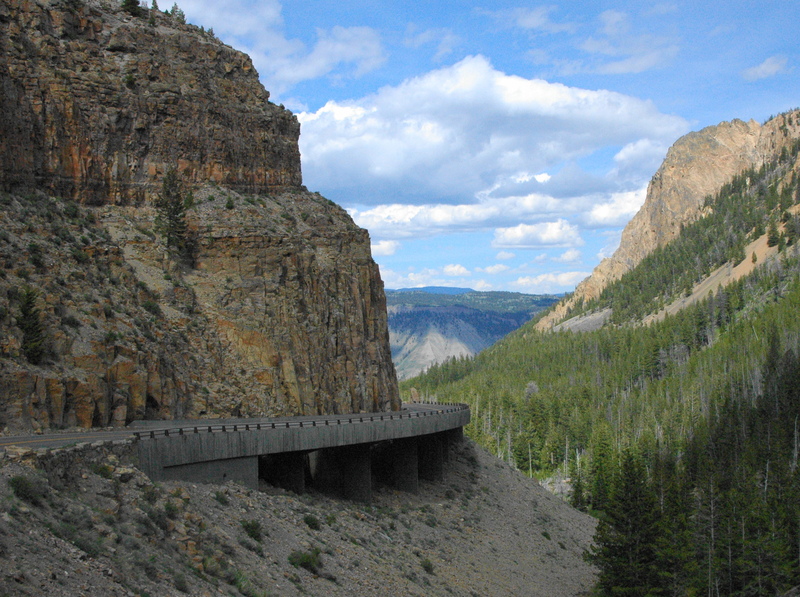 The first bridge in this area was built in 1885 after blasting out 14,000 cubic yards of rock, and hauling them off via horse and wagons. By 1900, the bridge was too unstable and stagecoaches were falling off. The bridge has been rebuilt 3 times since, most recently in 1977. A highlight of our trip today was a brief visit with Christine and Herb, who were busy working at the Mammoth Hot Springs gift store. We worked with them last year at Crazy Horse. It was great catching up with them, and we hope to try to get together this summer, although our off days do not coincide with theirs.